If there’s one way to make sleep time more glamorous, it’s with a flamboyant and fabulous eye mask, just like those featured in this post. 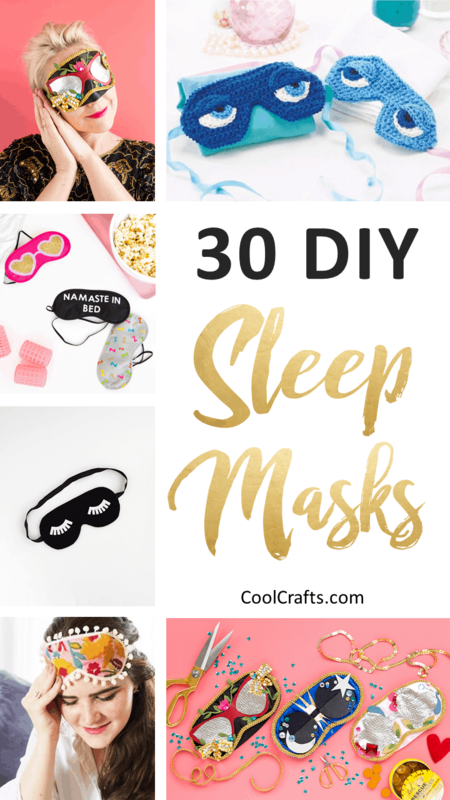 In that case, you’ll be pleased to know that we’ve rounded-up 30 of the most amazing DIY sleep masks that you can easily make yourself. From floral prints and sequins, to pom pom adorned, animal inspired, and everything else in-between – you’re sure to have a field day with these creations! Here are a pair of DIY sleep masks from A Beautiful Mess that are worth hitting the snooze button for! There are two awesome designs to choose from – which one do you like most? Whether you preferred your eggs poached, fried, or scrambled, this DIY sequin egg sleep mask from A Beautiful Mess is almost too stylish to take off! These DIY kitty sleep masks might look cute, but they also have amazing aromatherapy properties too! What a clever idea from Adventures in Making. Aww Sam is another talented blogger who has created two DIY sleep mask designs for you to create yourself! They’d also make awesome gifts for loved ones. Attention all batman fans! Thanks to Craftsy, you too can create your own sleep mask inspired by the superhero. Here’s a fun and easy DIY sleep mask tutorial that you can follow from Curious and Cat Cat! You can whip one up in no time. Do you have a superhero in your life? Why not spoil them with a DIY superhero sleep mask, thanks to this tutorial from Cutesy Crafts! Dwanda has this amazing step-by-step guide to teach you how to create these 3 cool DIY sleep mask designs. Which one will you make? This clever and cute DIY glasses sleep mask from Dwanda is perfect for the spectacle-wearing male in your life! Surprise him with it for Christmas or on his birthday for a present that he’ll cherish every time he gets sleepy. How wonderful are these little DIY princess inspired sleep masks? You can find out all you need to know to create them yourself via the Disney Family website! Even eHow are getting in on the DIY sleep mask trend! We’re a huge fan of this pom pom adorned and floral version from the site. Go Make Me has created these colorful and sparkly DIY sleep masks as a fun sleep time accessory. What a great gift these would make at a girly sleepover! All you need is some felt and sequins to make this lovely DIY sleep mask from Hello Glow. Feel free to mix and match this design with your own color scheme! How adorable is this DIY owl sleep mask from Kristy Neale? Adults and children alike will love this one! Fancy a free sewing pattern PDF featuring this wonderful DIY sleep mask? Grab yours now from Made for Mermaids! Here’s three fabulous designs from the talented Makings Things is Awesome! These are both fun and simple to make. Every girl has dreamed of owning Holly Golightley’s sleep mask from Breakfast at Tiffany’s. Now, Martha Stewart has made that dream possible with this DIY tutorial. A satin sleep mask? Sounds luxurious to us! Make your own by following these steps from Momtastic. You can also make your own sleep masks with fun sayings on them, just as Motte has done. You’ll want to thank her for this wonderful guide! Whether you like your sleep masks to be floral or feline-inspired (with a hint of lace), this tutorial from Ohhh Lulu Lingerie has got you covered! How stylish! What’s a stylish sleep mask without some dainty lashes on it? This simple and sweet design is courtesy of Pottery Barn! Speaking of sweet, these adorable animal sleep masks feature a panda and a bear. Thanks Pysselbolaget for this cute DIY project! If you’re a fan of felines, we’re sure you’ll adore this DIY cat inspired sleep mask from Shelterness. Let’s make one right meow! If you love patchwork, then you’ll certainly love this DIY sleep mask from Slo Studio. It’s incredibly colorful! So Sew Easy has created an oversized sleep mask for those who want something a little bit different! You can follow this tutorial to make your own – don’t forget to choose your own favorite fabric. Oh my, these DIY sleep masks from The House That Lars Built are exquisite – like a masterpiece! You’ll almost want to frame yours they’re that beautiful. This simple eye mask tutorial from Tilly and the Buttons will teach you how to make the easiest, yet most comfortable, DIY sleep mask. Gorgeous! Fancy perfecting your crocheting skills? Top Crochet Patterns will teach you how to make these fantastic crochet eye sleep masks – divine! There you have it – 30 of the most amazing DIY eye masks that you can make yourself! Which projects were your favorites? We’d love to hear from you in the comments section below! So cute sleep masks! I can’t sleep with any lights on so I need a sleeping mask. I’m ready to make these sleeping masks, it is much cheaper than buying them. Thanks so much for the wonderful article. I have my own design idea for a sleep mask, but I didn’t find it here. I have zero sewing skills, but somehow… I want to see my design come to life for a brand that I’m working on. If anyone can assist me, PLEASE email me. Thank you!